The following was originally published in the ISF October 2018 newsletter. Join our mailing list here to receive upcoming newsletters. This Fall has been a wonderfully busy one with a mixture of breakthroughs in the classrooms, conference exposure for the program, and internal training for our Inner Strength instructors. When I was teaching last week, in a 12th grade Civics class at one of the Mayor’s Office of Education Community Schools (a turn-around school that welcomes outside providers to support students, parents, and the neighborhood), we talked a lot about the types of thoughts that crowd our minds all the time. Teens spoke about everything from friends to grades to work to family to money issues to safety issues. After explaining with some experiential somatic methods what it looks like to “get some space on thought” or dis-embed from our identification with everything in our minds, we did a short mindful breathing exercise (listen to examples and instructions for Breath Meditation, and other mindful practices here). In a school that is rarely still, where students’ tempers can run high, and police are regularly in the immediate area to prevent violence, the room became quiet. I was amazed at how still it was since that rarely happens especially in the first session. We had committed to sitting still for 8 minutes, three minutes went by and it seemed awfully long. I breathed and decided to keep going and see what happens. The five minute mark passed and there were a few shuffles, a student entered the class, the pre-school next door let out a posse of squealing 4-year olds for recess, an ambulance let loose its siren. We kept still. Just before the 8-minute mark, I gently prompted the students to bring their attention back and to finish the exercise with the sound of a bell I use. The students looked around a little bleary eyed. “How did it go?” I asked. Two young men both started speaking at the same time. “I felt so peaceful!” one started, a little bewildered. “I haven’t felt this happy in I can’t say how long,” the other chimed in. I looked at the teacher, who was smiling ear to ear. As an educator, when you see insight dawning in one of your students, there’s nothing more fulfilling and encouraging. If you find yourself discouraged by so much challenging news these days, remember that the spark of creativity can ignite anywhere, at anytime. And a spark can lead to a forest fire. I feel privileged to be able to spend my time blowing on embers and seeing some hearts catch fire. 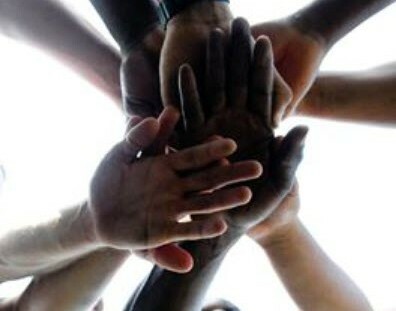 Learn more about the Inner Strength teen program here. 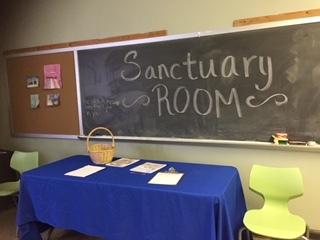 It has been two-and-a-half years in the making, from the vision of Principal Karen Thomas, to generous donations from Lowe’s Community Fund for paint and plaster, to grants from other individuals, the Sanctuary Room at one of our high schools is now fully up-and-running and in use. Students are referred down by teachers or counselors for attention, stress, anxiety, focus, or regulations issues. Class teachers can bring their class for a 20 minute re-fresher lesson. And the students who have already trained through our full teen program now come in on their lunch breaks to quietly reflect, recharge, and spend some positive time with themselves. Staffed by the school’s counseling department and Inner Strength instructors 3 days a week, we are so happy that the students now have a concrete space that they feel is their own for this all-important work. Thank you Julie Coopersmith, the Inner Strength on-site coordinator for your tireless effort and work to help teachers and students learn how to take advantage of all this resource has to offer. Each month in The Conscious Classroom Webinar, Amy will share reflections on what is working in classrooms where the Inner Strength program is serving several thousand teens each year. In these webinar sessions you’ll learn tools and perspectives that will support you and the teens you teach or mentor or parent. Sign up here to attend the free monthly webinar.